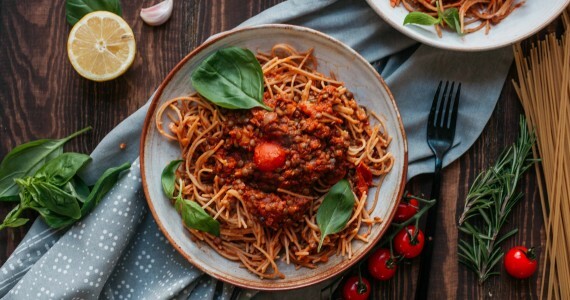 This lentil and mushroom bolognese may be meat-free and vegan, but we promise that it's not without flavour and taste! Rich and comforting, it's the perfect family friendly meal to enjoy on a budget. Heat some oil in a pan. Add the onion and cook for a few minutes, stirring often. Add in the garlic and cook until the onion is translucent. Add in the celery, carrots, red pepper, rosemary, bay leaves and tomato puree and cook for another minute or so. Next, tip in the chopped tomatoes, veg stock / wine, fresh tomatoes, oat cream / butter, Nutritional Yeast, vegetable stock cube and coconut sugar / lemon, if using. Bring to the boil, then reduce to a simmer and cook until slightly thickened (around 30 minutes), stirring every so often. Remove bay leaves, then place in the blended and blitz smooth. Pour the sauce back into the pan and add the bay leaves once more. Add in the drained lentils and the mushrooms (and a splash of water, if needed) and cook on a low to medium heat until rich, thick and tomatoey and the lentils are cooked but still retain a bit of bite. (I cooked mine for another 30 minutes). Add more water if needed, but stir often to prevent it from catching. Stir the basil leaves through, then season to taste. Pour into bowls with the cooked spaghetti, then sprinkle over Nutritional Yeast and chilli flakes, if using. Add a squeeze of lemon juice and enjoy immediately.